Over the next seven years, investments of over $1.25 billion are expected for chatbot development. With investments that high, the stakes are high as well. Mistakes can be costly and especially when a technology is still relatively new a lot of money can go down the drain pretty quickly if not implemented correctly. Making sure that your chatbot can give the right answers to FAQs, that it can help to improve sales, and can take off some of the work load of your customer service agents is not always an easy task to accomplish. Especially if you are somewhat new to the technology, help is needed as chatbots are only ever as good as the user experience they provide. 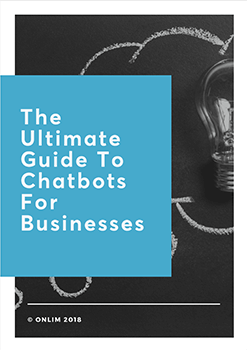 To avoid the most common chatbot mistakes we outlined some examples of what you shouldn’t do and also provided you with some solutions to create chatbots with value, both for your business and your customers. The greatest challenge when it comes to chatbots is not necessarily a technological one. More so it is about the actual interactive experience customers have. A successful chatbot ensures ease of use and the creation of actual value for all parties involved. The way in which a chatbot communicates is a representation of the company it “works” for. If your business is selling beauty products you are clearly speaking to a different target audience than you would if you were selling solar panels. Making sure to address your audience the right way will make or break the sale. Further, a chatbot is meant to be a quick customer support solution. Long, multi-leveled communication processes are nothing but frustrating and should be avoided. Instead, keep the interactions simple, fast and focused. This approach allows customers to get the quick help they desire and the development of the chatbot can be streamlined to what actually works. The conversational flow of chatbot interactions is of utmost importance. Having multiple ways for a customer to get where they want is very important. Chatbots are still learning and not always capable of understanding everything that is thrown at them. When it does not clearly understand the customer’s message, alternative routes of problem-solving should be available. Conversational dead ends are frustrating for your customers and often lead to interactions being dropped. The more clarity your chatbot can provide the easier customers can get the help and experience they are looking for. When it comes to marketing the “safe” solution is becoming more and more prevalent. This approach works well enough, but for a business that is interested in outstanding results, outstanding services must be created too. A remarkable brand has an actual personality that people can relate to. This is an important aspect of building connections with your customers. When it comes to your customer service and the use of chatbots it is no different. A bland and boring chatbot can do the job, but it will never excite your customers or even make them come back just for the experience they enjoyed so much. Let your chatbot have an actual personality. Humor and wittiness combined with a bit of banter and silliness make for fun interactions that stick with your customers. Choosing a fitting name, avatar and personality profile can make a huge difference in the acceptance of this new customer service channel. Business is a highly strategic endeavor. So why not approach all of its aspects strategically. Too many companies are falling short on following through with their ideas. They start off and dip their little toe in the next big thing but don’t go all the way. The greatest recipe for failure. A strategic approach calls for a deep understanding of the space you are entering and of how to use the existing capacities to their best potential. This is no different to chatbots in any way. You must be very clear about how they work and the benefits they can provide to the business and customers. If you are a bit overwhelmed or just generally excited about the possibilities chatbots might offer to your business, we are here to help. At Onlim we develop chatbots that take your customer service to the next level. Click here to learn more about the solutions we are offering, and we are happy to have a chat about your specific needs.